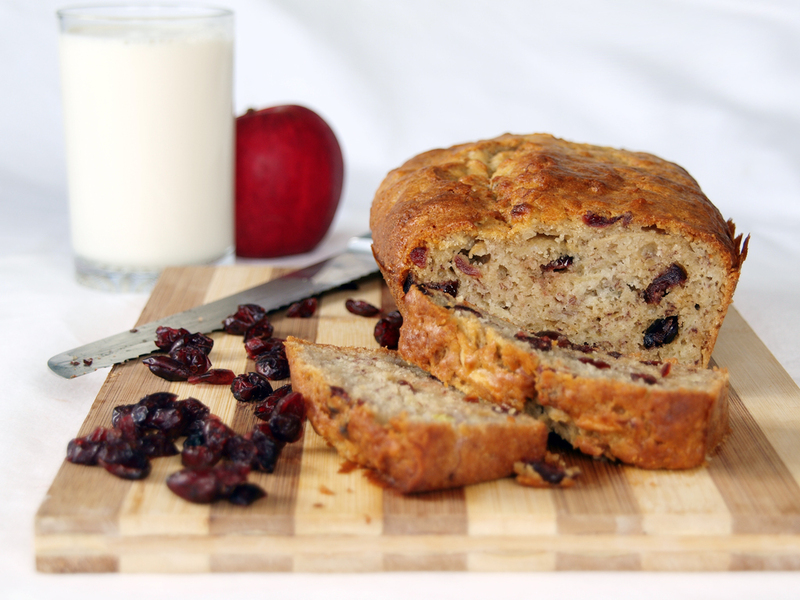 What’s good with banana cake or loaf is that it’s so versatile you can add different flavours to this wonderful base and this is one of the best variations that I had tried the Banana, Apple and Cranberry Loaf. It was made by my missus adapted from the recipe of my sister-in-law and the result was phenomenal, a moist and fruity banana loaf. In a mixing bowl, combined flour, baking powder, baking soda, salt and sugar. Mix well and set it aside. Lastly add in dried cranberries. Mix well and pour it into a greased baking pan. Place in a 180C preheated oven and bake for 50 minutes or until golden brown. I love the banana and cranberry together. I can hardly wait to try it. Any recommended substitutes 😀 ? I have bananas going brown on my kitchen counter and this could not have come at a better time! This sounds like an awesome combo!! Love it! Gotta love a mix and bake cake! The flavours you picked are great! I really love your style, and your photos are so magical! Wonderful banana bread! Great flavor combination! sounds and looks just yummy! Hm sounds good! I occasionally (this is the key point) make banana bread and have tried different recipes throughout times. I’d love to try this recipe next time I bake! Cranberry bread and banana bread are my two favorite quick breads, but I never thought about combining them. DUH! What a great idea and what a moist, delicious looking bread! that sounds good, with the banana and apple together. a good summer or fall bread! Well, you know how we feel about our banana loaves around here. 😉 This looks like a real winner. I love the cranberries! I love banana bread – it’s so delicious toasted with butter. I love the combination you have here. I agree, I’m a big fan of eating these kinds of loaves for breakfast or snacks or anytime 🙂 Great idea to use all three fruits for a nice mix. This looks and sounds very tasty Raymund. The picture is so inviting. Well done.